Ja-Co Welding has filled their design department with a combination of well-educated/experienced staff and the latest in Autodesk products to ensure the customer’s full vision is achieved. With the company’s standard of superior service and over 15 years of design archives no job is too small or too complicated for the design team to accomplish. With long term clientele in mind we thrive in producing timely, well targeted, affordable solutions for any situation or product. 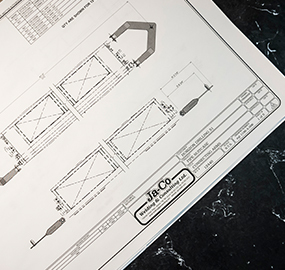 Ja-Co Welding’s design team consists of Engineering, R&D, Design and Drafting specialists all working towards the same goal of making the customers dream reality. Using Autodesk Vault, AutoCAD mechanical, and Autodesk Inventor Pro equipped with FEA we can optimize any design to be more practical, innovative, and efficient. Ja-Co Welding’s insightful design staff are willing to go the extra mile to ensure the end product fulfills any request, and with a history of design ranging from horse barns to telescoping-triple land based oil-rigs there is nothing that we cannot do to help achieve any vision. With design and fabrication at your beckoning this makes Ja-Co Welding your one stop shop for steel fabrication.